Rocco and Rucco occupy a three-bedroom apartment two-minutes by foot from the Colosseum. What Rocco describes as “the most beautiful road in Colle Oppio” runs up from Via Labicana to the Parco di Colle Oppio. Two young professionals, not long graduated, they choose to rent their third room to a female erasmus student. They’re very nice. But their company comes at a high price: €600 pm. “Do you take erasmus students because they will pay more?” I ask. Any foreign girl looking for a room in Rome will naturally question the motives of older men who opt to live with a foreign stranger over a local friend. Though I’ve only heard of one case where the situation hasn’t worked out well – a German girl whose male cohabitant turned out not to be a student at all, but an out-of-work psycho who would dominate the kitchen and make it his business to monitor her every movement. Of course every city is full of odd singles living alone. One friend on her year abroad in Paris found herself sharing with a middle-aged manic-depressive who emotionally blackmailed her into remaining – just “one little piece of stability, pLEASE!” (She eventually managed to extricate herself and settled more happily into the company of three pashmina-wearing Jewish girls in their early twenties. And even ditched her perennial Oxford hoodie to adorn herself more comfortably with a tasseled pashmina too). Another in London was warmly welcomed to a room in South Kensington, but told on arrival that he was to cook no meat, drink no alcohol and invite no friends back to the apartment. Whilst on the hunt for accommodation last June, even though able to speak enough Italian to negotiate a contract, I was not naive to the fact that, as a non-native and novice to the Italian housing market, I would be paying more than a savvy local. Finding somewhere cheaper, more spatious and in what felt like a more classically Roman building, I didn’t take their room in the end. But, having kept in touch, they’ve been able to shed some light on the flat-share industry in Italy. 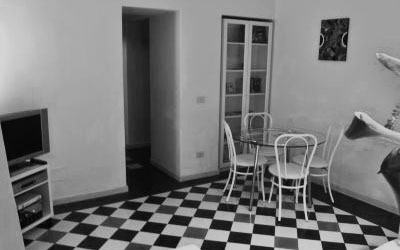 Where moving into university accommodation as a first-year has become a rite of passage for many British students, in Italy the cultural norm remains to stay at home and attend the local university. Rocco and Rucco agree that leaving home at 18 is a very serious step. “But what if you’d prefer to study in another city?” I demand. Though now in his late twenties, Rocco, a Roman, estimates that just 3-4% of his friends have moved out of the family home. He himself has only been living independently for a year and a half. For me it’s hard to understand. I get that it’s more economical to stay at home, but surely there comes a point…(where you absolutely can’t bear to live with your parents any longer). However, as the capital city, there are still many Italian students looking to flat share, many of whom come from surrounding rural areas or the islands to study here. Which is of course one of the best ways to learn the language. Living with older professionals though can also be a fascinating eye-opener into city life outside of the student bubble.